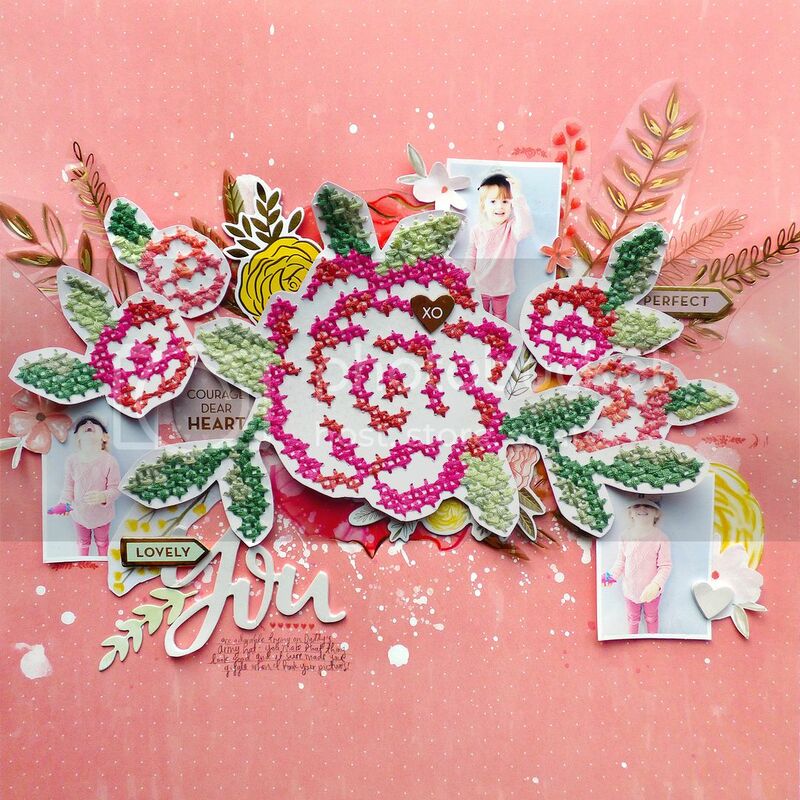 As promised, here is the 2nd layout I made for Scrapbook Expo! 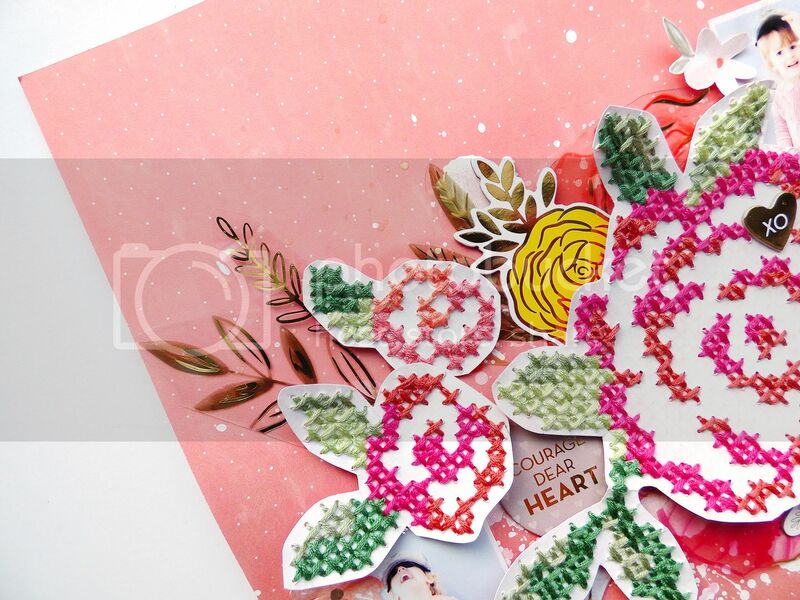 DESCRIPTION: There is another paper in Take Me Away that was made to be cross-stitched: Paper 14, the one with 5 pretty flowers. I was in the mood to keep cross-stitching so as soon as I finished the first layout above, I got right to work on this one. JOURNALING SAYS: You are adorable trying on Daddy's Army hat - you make that thing look good! And it sure made you giggle when I took your pictures! HOW TO: Splash white acrylic paint on the B-side of Paper 07, let it dry, then splatter pink and coral watercolors on top. Cut out the flowers from Paper 14, poke holes for stitching, then cross stitch through the flowers using your chosen colors of thread. I used more colors than were printed on the papers to give them more texture and "oomph". Layer a piece of floral transparency paper, the embroidered flowers, and a trio of photos over the background. Fussy cut three smaller flowers from Paper 17 and adhere them along with chipboard stickers around the layout. Add "You" phrase for the title and journal below in pencil. Bring in more yellow with a chipboard flower sticker and two yellow pieces fussy cut from the floral transparency then backed on white cardstock. 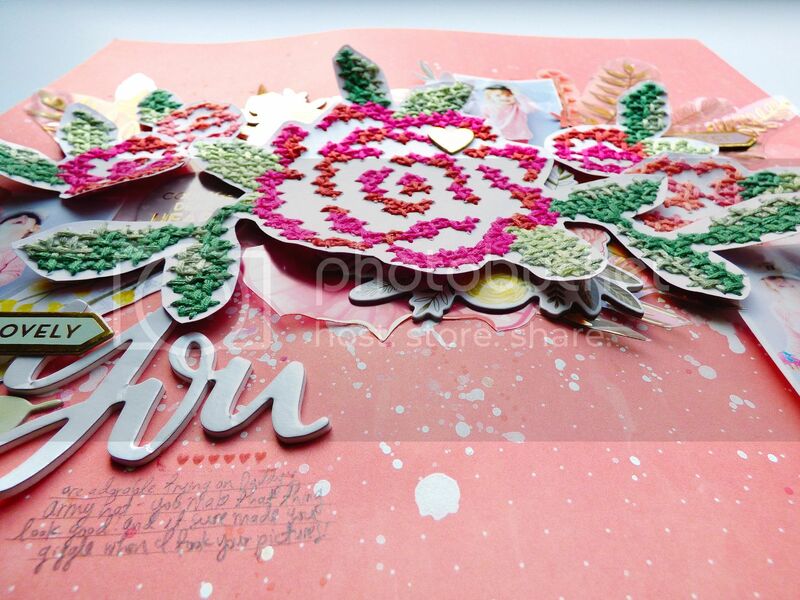 For the finishing touch, stamp flowers and hearts around the photos and title using the roller stamp and coral ink. Holy smokes woman... this is AMAZING!!!!!!!!!!!!! You are a scrappy goddess!!!!!!!!!!!!!! Wait while i pick my jaw off the floor....this is stunning! Absolutely stunning!